What's the point of education? Last week The Globe and Mail ran an opinion piece calling for coding to become a mandatory subject in Canadian schools. I’m sympathetic to the idea, for I agree that computer literacy and an awareness of how the algorithms and programs that increasingly influence our lives is crucial to being an informed citizen. That being said, I disagree with almost all the points made in that article. More generally, as I continue to think about my own opinions of the state of education here in Ontario, particularly when it comes to math, I keep coming back to the question that heads this post. Parents have certain expectations when they send their children to school. They’ll learn to read, write, do math, maybe learn a second language, generally prepare for postsecondary education and build a foundation for entering the workforce. But most Canadian kids aren’t getting everything they’ll need for the working world that will await them upon graduation. I knit entrelac now. Entrelac is cool. You can read the linked Wikipedia article for all the details, but entrelac is basically a knitting technique that involves working a series of rectangles (and triangles) to create a patchwork effect. 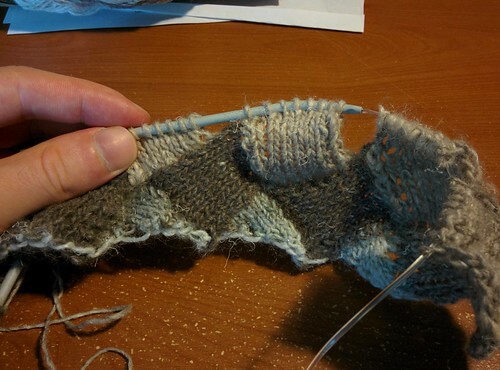 Instead of knitting across all the stitches on a row, you knit back and forth across a set number of stitches (e.g., groups of 8) over and over. In the process of doing this, you create a slipped stitch edge that you can pick up to create the rectangles on the row above. So as you work one entire "row" or tier of your entrelac project, you get rectangles slanted in one direction and then rectangles slanted in the other direction. Here's what I mean.